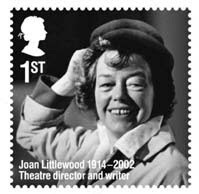 The latest slogan postmark in the Remarkable Lives series is now in use for Joan Littlewood, who was born on 6 October 1914. Littlewood was born in a working-class district of south London. She left the Royal Academy of Dramatic Art early, and was a founder of the agit-prop-inspired Theatre Union in Manchester. After the Second World War, aiming to bring a fresh kind of theatre to a new audience, the company toured the UK and Europe as Theatre Workshop before settling in 1953 at the run-down Theatre Royal in London’s East End. She revolutionised British theatre after the Second World War by making the classics immediate and by turning raw material relevant to its time into productions of international acclaim. Chief among them was the eye-opening First World War entertainment Oh What a Lovely War. This example from Chester and N Wales MC shows the reverse layout normally applied to the right side of square envelopes (where the machinery has aligned the stamp to the top left corner).